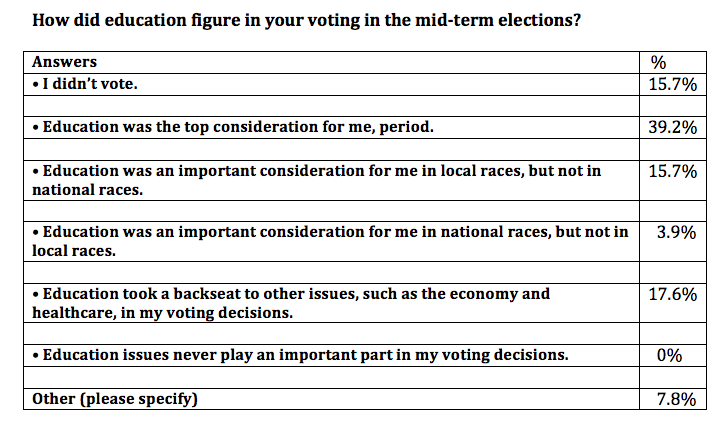 With 9 days left to vote in our survey on the 2010 mid-term elections, here’s an update on the voting so far. We now have nearly 6 times as many responses. The biggest changes are to the first two categories: those who didn’t vote and those for whom education is the top consideration. The first increased; the second decreased. The increase in the first category is explained both by the fact that the 2010 turnout rate according to the United States Election Project was 40.3%. 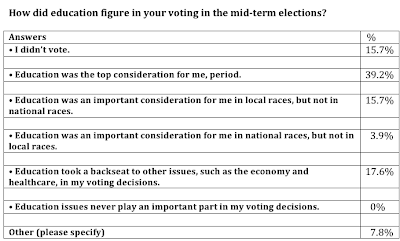 The upturn in the first answer, therefore, may mean that our survey is actually more representative. 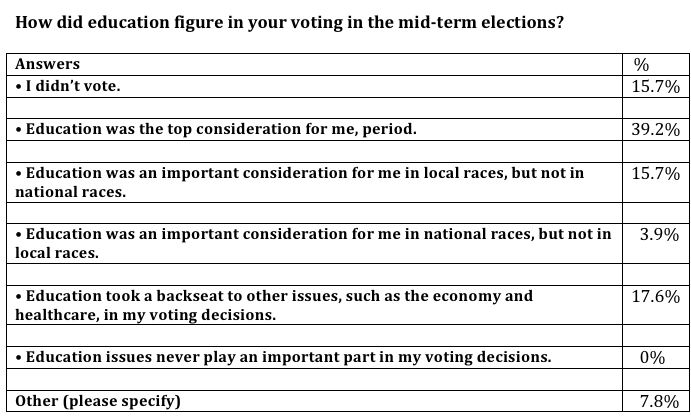 To assure its accuracy, however, we would also have to know how many “I didn’t vote” answers were attributed to voters and how many to people who were interested in the survey but are not eligible to vote, for whatever reason. While “Education was the top consideration” remains the top choice at this point, it’s drop is not surprising in a more diverse audience. We’re hoping for as large a show as possible, so if you haven’t voted yet, please do so here. 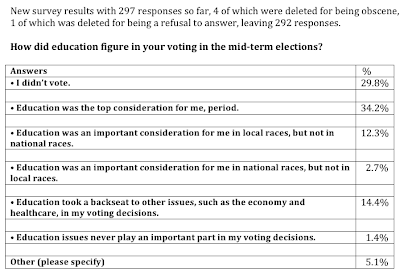 This entry was posted in Uncategorized and tagged education survey, Election day, how education issues influenced voting, voting on November 22, 2010 by admin. 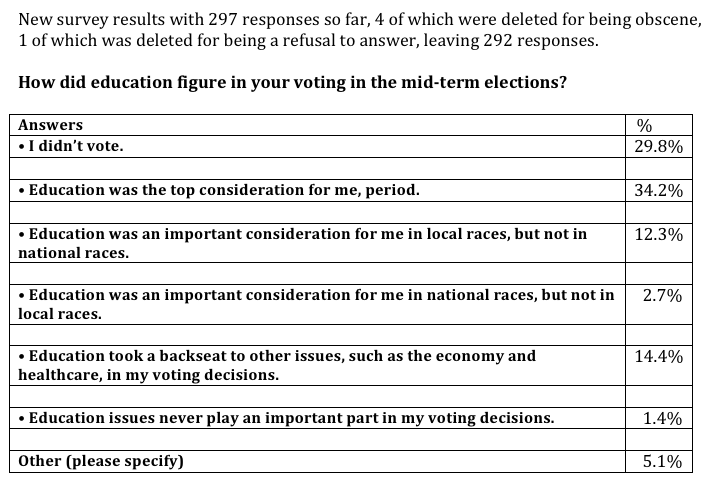 Today, we have a glimpse at our new survey results on the role that education played in influencing people’s voting choices in the midterm elections, as well as a look back at our survey on the success the Obama administration has achieved in the area of education, which has gained quite a few more responses since our report at the end of August. First, let’s take a look back. Here is a chart showing the preliminary results on the August survey, the intended-to-be final report at the end of August, and the current figures. As before, obscene remarks have been deleted, while “Other” response that are related to education, but not clearly “yes” or “no” have been allowed to stand, but not included in the “yes” or “no” count. 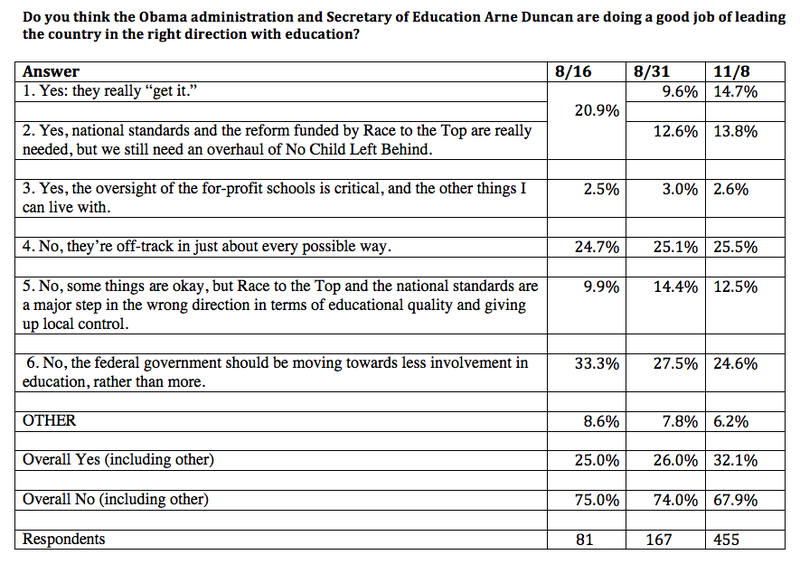 In this second summary chart, the responses have been ranked. Notice that while the “No” answers were ranked 1, 2, and 3 at the end of August, they are back to being 1, 2, and 5, with “Yes” answers taking 3rd and 4th place, as they did in mid-August. 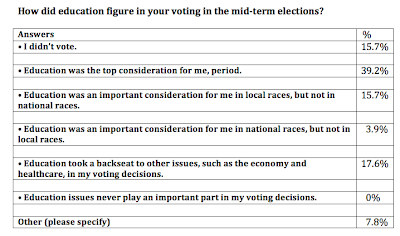 Here, now is a first look at our November survey results. If you haven’t yet shared your response with us, please don’t forget to vote here! Glad, for once, to see 0% in a poll! This entry was posted in Uncategorized and tagged education survey, Obama administration, politics and education, voting on November 8, 2010 by admin. Election Day brought mixed results in a lot of respects, both nationally and locally, and left us with a Congress and President who are going to need to have a conversation and compromise in order to move forward. As many Americans are reflecting on what led to these results and what the road ahead holds, we want to take a look at the election from the standpoint of education. 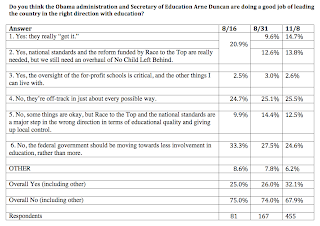 Going back to our August survey on the Obama Administration, which I reported results for on August 31, people have continued to vote. When I wrote up the report, there had been 167 usable votes. Now, there are 457. The question was: Do you think the Obama administration and Secretary of Education Arne Duncan are doing a good job of leading the country in the right direction with education? It seems like a lot of people continue to have something to say, so I’ll be doing another report next week, providing the new totals, and comparing the percentages from August 31 with the current picture. which received 27.5% of the vote, remain the favorite? Visit next week to see the updated results. In the meantime, don’t forget the current survey. This entry was posted in Uncategorized and tagged education survey, Election day, politics and education on November 5, 2010 by admin. There are still 2 days left to respond to our survey on national K–12 education standards, and I’ll be providing a final report on Wednesday. Then we’ll go on to the July survey. As of 9 am Eastern time today, 163 people have responded, 71 more than June 18, when I gave the mid-survey roundup. Since we have 168 likes, that’s still not everyone, so for those of you who haven’t yet voted, I want to mention that we’ve moved to a one-question survey, so it won’t take much of your time to answer. If you haven’t done so yet, please cast your vote here. More analysis to come on Wednesday! This entry was posted in Uncategorized and tagged education survey, K-12 education, national standards on June 28, 2010 by admin. There are still 13 days left to respond to our survey on national K–12 education standards, but I wanted to take this opportunity to tell you how the preliminary results are looking and to encourage you to respond if you have not yet done so. As of 10 am Eastern time today, 92 people have responded, and this is a little less than half of those who have liked the page, so I know that some of you haven’t yet voiced your opinion. For those who haven’t, I’d like to point out that we’ve moved to a one-question survey, so it won’t take much of your time to answer. • More than half of respondents favor national standards, either for consistency or because they feel it would be an improvement over their state standards. • More people who do not want national standards chose that option because they thought that it is a task that belongs to the local level rather than because it would lower their own state’s standards. More to come at the end of the month: in the meantime, please vote if you have not done so. This entry was posted in Uncategorized and tagged education funding, education goals, education survey, national standards on June 18, 2010 by admin.